So you want to build robots? Maybe even start a career in robotics? My favorite robot of all time is . . . The first thing you should know (if you don’t already) is that you’re making a great choice: The field of robotics is growing tremendously, and robots are expected to have a profound impact on business, healthcare, manufacturing, education, transportation, entertainment, and almost every other productive area of society. Robots will change the way we live. And did we mention they’re also a ton of fun? The second thing you should know is that we can’t tell you just one thing you can do to get started in robotics. There are many ways to get started, and different people take different paths. But that’s actually good news: You have many choices, and this guide will help you navigate your options. Throughout this section you’ll also find audio of roboticists talking about their careers, different things you could do to get into robotics, and (check out the sidebar on the right) their favorite robots of all time. And if you’re already into building robots and are looking for undergraduate and graduate degrees in robotics and related areas, we have a section that covers that. If you’re already working in the field and would like to network and share information with fellow roboticists, you’re covered, too. And if you’re Rodney Brooks and you’re reading this, hey, give us a break. You know too much already, mister! FIRST is a robotics competition designed to teach students the principles of science and engineering and also to promote teamwork and collaboration. FIRST organizes a series of events for students ages 6 to 18. The main program is the FIRST Robotics Competition, in which teams of high school students from all over the world build robots capable of moving and performing tasks, such as balancing on bridges and shooting balls through hoops. Teams both compete and collaborate during the matches. They participate in regional tournaments that culminate in a world championship. 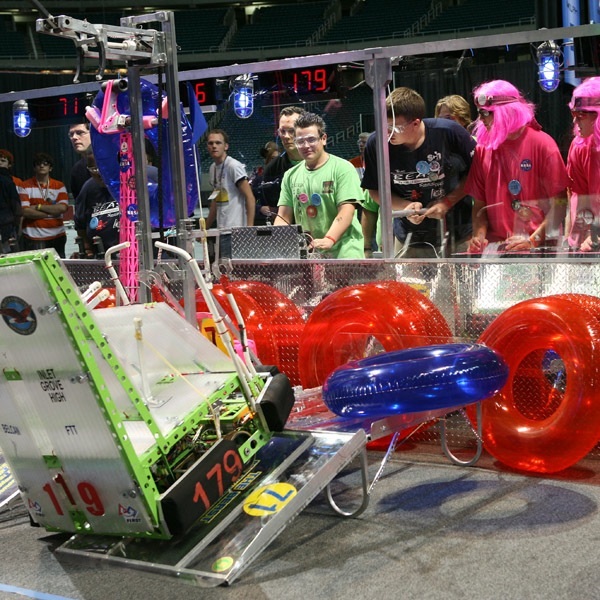 Every year the game changes, and the teams have to build robots with new capabilities. With help from mentors, students learn not only robotics but also respect, professionalism, integrity, and other life skills. What more could you want? FIRST (For Inspiration and Recognition of Science and Technology) was created by engineer and entrepreneur Dean Kamen. He’s the inventor of the Segway, the iBot, the DEKA Arm, and several other technologies. Tap the play button to listen to him talk about FIRST and you’ll understand why it hasn’t stopped growing since Kamen started it more than 20 years ago. The best way to start building robots . . . is to just start building robots. A pile of loose motors, sensors, and microcontrollers looks daunting at first, but you can find robot kits and instructions to fit your skill level. If you’re just starting, a good kit is the Lego Mindstorms NXT (http://mindstorms.lego.com ). Before you say, “Legos are for kids!” you should know that this set, with 619 parts, includes four different kinds of sensors, three rather sophisticated servomotors, and built-in Bluetooth radio. It can even do floating-point calculations. The heart of the kit is its computer module, the NXT “brick,” which you program using Lego’s graphical programming language, NXT-G. National Instruments helped to develop this user-friendly environment, which is based on NI’s well-known LabVIEW (Laboratory Virtual Instrumentation Engineering Workbench) software. With some dragging and dropping, you can quickly develop programs that, with the click of a mouse, are compiled and then sent over USB cable or Bluetooth to the NXT brick. You can build robots that drive around and pick up small objects or shoot pellets at whatever comes into its ultrasonic sights. And if you want more-advanced coding options, the Mindstorms software ecosystem now includes dozens of other ways to program the NXT brick, including Processing, a C-like language and development environment that’s also used to code applications in computer vision, data visualization, music, and electronics. Legos are cool, but if you’re looking for something more advanced, there are dozens of kits that include all the parts you need to put together full robots. In fact, there are too many to list them all here, so we’ll point you to some sites where you can find out more: Adafruit Industries (http://adafruit.com ), Parallax (http://www.parallax.com ), RobotShop (http://www.robotshop.com ), Sparkfun Electronics (http://www.sparkfun.com ), and VEX (http://www.vexrobotics.com ) are online stores that offer a huge assortment of starter and advanced kits. Some of these are based on the Arduino (http://www.arduino.cc ), a low-cost microcontroller board that hobbyists use to build, among other things, mobile robots and robotic art installations. Another kit that might be worth a mention is the Hummingbird (http://www.hummingbirdkit.com ). Created by former Carnegie Mellon roboticists, it is designed to make building a robot as easy as possible: sensors, actuators, and controller are all included, no soldering is required, and you program it using a drag-and-drop visual programming interface. And if you want to build robots from scratch, you can buy parts on the sites above and find robot designs and instructions online. Good places to scout for projects are sites like Instructables (http://www.instructables.com ), Let’s Make Robots (http://letsmakerobots.com ), and MAKE Magazine (http://makezine.com ). If you want to build autonomous aircraft, quadrotors, or other flying robots, check out DIY Drones (http://diydrones.com ). And to see what other people are building (or to get help if you’re stuck), you can find dozens of robotics clubs and discussion groups on the Net. One example is Robots.net (http://robots.net ). 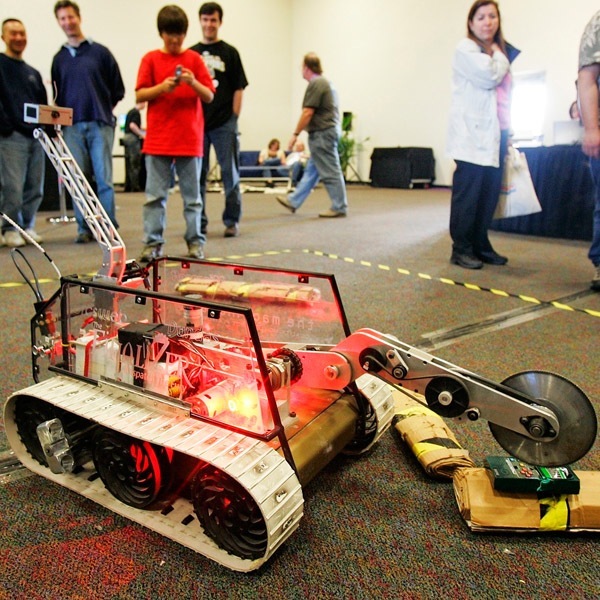 Some groups even meet in person, like the HomeBrew Robotics Club in Silicon Valley (http://www.hbrobotics.org ). Finally, if you want to build full-blown robots that will let you explore some of the most advanced DIY robotics hardware and software out there, we’ll give you two options: The first is TurtleBot (http://turtlebot.com ). It’s a robot development kit with a mobile base, Microsoft Kinect for 3D mapping, and advanced open-source software, including the Robot Operating System (ROS), which is used by top research labs all over the world. The second is Qbo (http://thecorpora.com ), a small mobile bot that comes equipped with cameras and other sensors. It runs Linux and ROS, and is powered by Qbo-specific open-source applications that let it drive around, speak, and recognize objects. One thing people say when they see these robots is, “Hey, there’s no arm! It can’t really do anything useful.” Exactly. You got yourself your first project. If you’re a teacher looking for robotics kits and course material, check out the Carnegie Mellon Robotics Academy (http://www.education.rec.ri.cmu.edu ), part of CMU’s Robotics Institute. It offers free complete curriculum programs for middle- and high-school-level courses. Some people like to build robots. Others like to build robots that destroy robots. If you’re into combat robots—robots that go at each other with hammers, saws, and flame-throwers—the place to go is RoboGames (http://robogames.net ). The games take place every year in California and feature a variety of combat categories and many noncombat events, too. 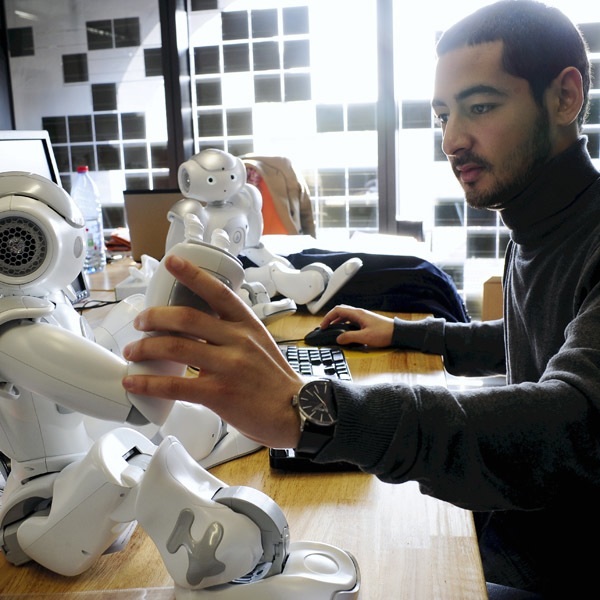 In Japan, competitions geared toward hobby roboticists happen throughout the year. There’s robot sumo, robot racing, robot maze-solving, robot dance-offs. 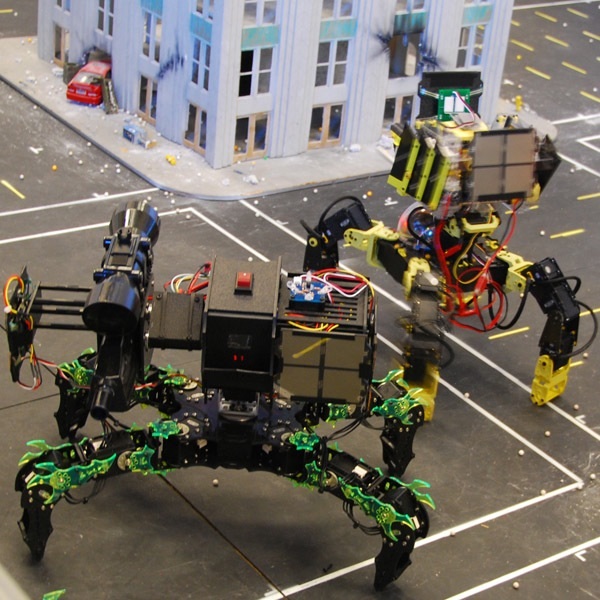 The most popular competition is called Robo-One (http://www.robo-one.com ), which features one-on-one matches between small and medium-size humanoid robots. As Dean Kamen puts it, robotics is becoming a catchword for a lot of science and technology disciplines that come together to help humans solve problems using autonomous and intelligent systems. Indeed, it takes different skills to design, build, and program a robot. Many roboticists have degrees in electrical engineering, mechanical engineering, and computer science. But you don’t have to get a degree in one of those fields to become a roboticist. You can study bioengineering and focus on the intersection of robotics and medicine. You can get a degree in mathematics and work on artificial intelligence. 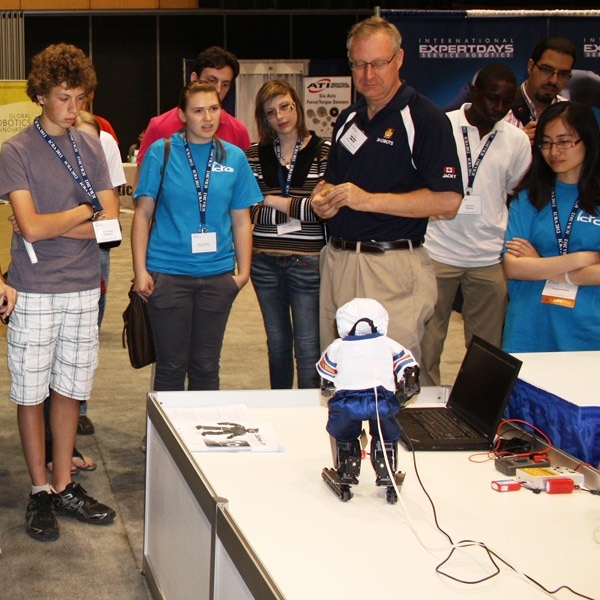 The world’s top roboticists are members of the IEEE Robotics & Automation Society (RAS). And you can become a member, too! RAS is an organization open to all researchers and professionals working in the field. You can network with the other 10,000 members, collaborate, exchange information, and look for career opportunities. RAS publishes one magazine and two journals that are among the highest-ranked publications in the field based on citations and impact. RAS also organizes the two largest research robotics conferences: the IEEE International Conference on Intelligent Robots and Systems (IROS) and the IEEE International Conference on Robotics and Automation (ICRA). Thousands of roboticists converge at these conferences, which feature paper presentations, live robot demos, keynote talks, and an exhibit hall for robotics companies. Details on Lego Mindstorms from “Robot Gift Ideas,” by David Schneider, IEEE Spectrum, December 2011. Photos (from top): iRobot; UCLA; TRI; Adriana M. Groisman; DEKA Research; Randi Silberman Klett; Kimberly White/Reuters; Evan Ackerman; David Yellen; Jerome Chatin/Expansion-REA/Redux; Kathy Colabaugh/IEEE Robotics & Automation Society.